If you’ve ever experienced a blown tire while driving at high speeds, you know how dangerous and scary it can be. Some designers believe that there’s no reason to stick with the standard air-filled tire design that we’ve been using for the entire history of cars. 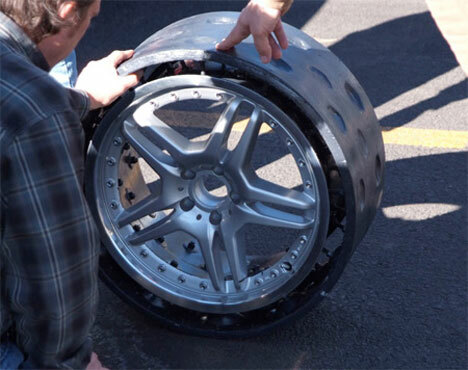 Although it’s not a brand-new concept (other designers have come up with airless tire ideas), the Energy Return Wheel, designed by Brian Russell, uses Kevlar and carbon fiber construction for super strength, increased safety, and higher fuel efficiency. By taking the air out of the tires and making the remaining tire components super-strong, the design eliminates the hassle and expense of flat tires. Airless tires may even perform better than traditional tires. Current prototypes are meant only for dry pavement, but eventually the ERW will be appropriate for all types of weather. 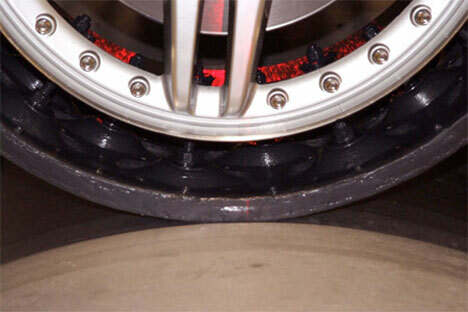 Previous designs for airless tires have had problems with heavy vibration, high noise and alarmingly high heat levels. Russell says his design fixes those problems with an internal membrane that absorbs vibrations and transfers the power to the rotation of the tire. The Energy Return Wheel is still in development, but Russell states that the company is close to beginning mass production. Given that the airless tire design is impervious to police “spike strips,” which pierce tires to disable vehicles, we expect the new tires to be popular with shady characters and car enthusiasts alike. See more in Industrial Design or under Technology. December, 2010.